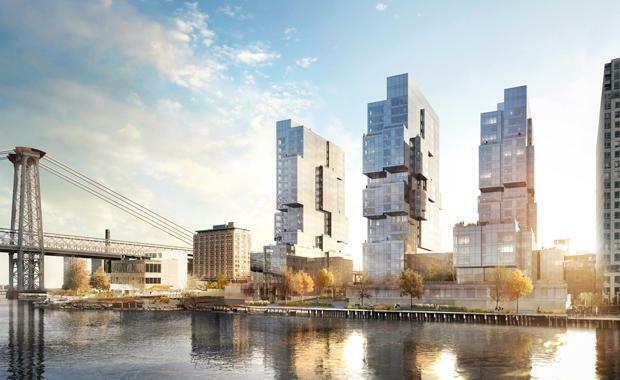 Former New York Governor Eliot Spitzer is making a significant foray into real estate with a grand development named Kent planned for the Williamsburg waterfront on Kent Avenue, just south of the Williamsburg Bridge in Brooklyn. Spitzer Enterprises and architect ODA New York have revealed designs for three ‘blocky’ 22-floor towers to rise in the East River precinct over the waterfront. Described by James Gardner of The Real Deal as ”… hulking, deconstructed and robotic monsters”-- and he means that in a good way, the building designs will maximise the number of desired corner units which are coveted in most buildings. In fact, ODA says that a remarkable 80 per cent of the 857 apartments will be corner units. Spitzer also served for eight years as Attorney General of New York prior to being elected governor. His father Bernard was a significant real estate identity in New York with Eliot now heading Spitzer Enterprises. Units will boast northern sightlines onto the Williamsburg Bridge, the East River, and eastern vistas of downtown Manhattan, and Kent’s promenade will border the communal boardwalk stretching from Greenpoint all the way to Dumbo. By using two standard floor plans—mirrors of each other—and flipping them in different directions around the central axis of each tower’s mass, the result is three distinct, multi-dimensional façades, each filled with mid-floor “corner” units. These shifts in floor plan will use cantilevering to ensure that a majority of units will also feature garden terraces—an ODA trademark and coveted rarity in any city.